A week that’s finally over. Hallelujah! In between the celebrations, my poor Philip had to work the weekend, and most evenings this week as well. His nights and weekend were spent waiting for fires and fighting fires because Kentucky has been so dry lately. He even got sent to a few real, and quite large fires. Yikes. Luckily, we got some much-needed rain on Thursday, so let’s hope for more rain this weekend. On Monday, I completed another week’s worth of homework, bringing me another week closer to finishing this degree. It is difficult fighting to feel well enough to do it for another 7 months, the motivation is lacking. This is mostly why I haven’t been back to cosmetology school in Kentucky because I cannot plan to feel well for 3-4 months, guaranteed, and every day missed is more fees due upon graduation. I cannot plan to feel well and have a normal person schedule, there’s too many doctors to call and doctors to see right now. If all goes well with our next treatment plan, then I may finish my bachelor’s degree sooner by doubling up course work if I can. I may begin class in January for a phlebotomy course. I figure if I am going to be at the VA and other doctors offices for the rest of my life, making visits more than often, I may as well learn about a few things and get a job working in a hospital. All while I continue to write, of course. The class would be 2 weeks and I would be certified to work. Pretty sweet and exciting deal, if you ask me. Setting a goal for January is a big deal, so we shall see how I feel then. Tuesday I was supposed to see mental health, to visit with my new therapist, for my second appointment. When I checked my online appointment calendar, the appointment had been placed at the wrong time, at 1 PM instead of 3 PM. I tried to reschedule it for the same day but they could not get me in for another week. So, instead of seeing him this week, I will see him next week on Tuesday. On Tuesday evening of this week, Philip had to work fighting fires until around midnight, so thank goodness I sleep wonky and I was up when he finally got home. Wednesday afternoon, what would have been Humira #5, was instead my repeat blood draw. Along with the ordered blood tests, some stool tests like calprotectin and c-diff were ordered, too. These look for inflammation in the bowels, so I tried to get the best samples possible. Wednesday, and all week really, I have been suffering slight chest pressure again. It feels as though someone is just sitting on my chest, and so I chalked it up to the Humira still in my body. We were hoping that it would be out of my system considering another dose was due. By Wednesday afternoon, we were contemplating going back to the ER for another chest pain visit, but instead, I called my GI nurse, who told me Dr. S would call me back. She never did. Go figure. Thursday came with another day of chest pressure, but I began having a brand new type of pain. Yay me? My right breast, in between my breast and my armpit, that flat side of your chest/breast where I assume the lymph nodes are, it began having sharp ripping/tearing/burning pains. The first time it happened, it came out of nowhere and I was instantly in tears. This pain isn’t constant, but rather comes and goes, shocking me every time. It feels as though someone is ripping my muscle from the inside or like someone is taking a knife to my breast, peeling back at the muscle. I can’t explain it any better, it is like nothing I have ever felt before. I move my arms with no pain, though. I have a full range of motion. I felt myself, and I even had Philip feeling both of my breasts, and there’s no changes or differences in the two. But all of a sudden, the pain will come, ripping at my chest for a few moments, and then it’s gone. We spent Thursday wondering if I should go to the ER, again, too. We decided if it continued or got any worse, that I would call the VA ER nurse, and see what they suggest. Waking up this morning, Friday, I had been up and down throughout the night, like I do most of my evenings and early mornings. I woke up at one point and I was dripping with sweat, with a migraine pounding at my left side of my head and inside my left eye, so I took my Fioricet and tried to lie back down. I think I slept a little while until Philip woke me. This morning Philip asked how my breast pain was, and before he could finish or I could reply, another ripping pain sent a shock through my chest and ripped at my breast. I had been awake a matter of minutes, already suffering pains. It has happened more today than yesterday, so much so that I called the ER nurse this morning, and I had to wait for them to return my call. The ER is better about returning calls, so I did mention the chest pressure from Wednesday, too. If anything, another ER trip would be, and was, requested. I swear I cannot win for losing. I keep gaining new problems without seeming to fix the old ones. With chronic illnesses come more problems. You cannot just have one issue, they come in pairs, or trios, or more, each month adding more to your plate before you can handle what you have in front of you already. It had been one month since my last ER visit, (Monday marks a month, technically) and I cannot believe I am still suffering from chest pains with these new pains. Trust me, it is a lot to deal with, whether you understand or not. I do not enjoy any of it. There is no positive from this. Before I could post this for my Friday post, my nurse, and primary care doctor, Joanna called me back, and they both had agreed that another trip to the ER was probably best. Chest pains are never normal, so I am writing this paragraph as I lie in the hospital bed at the VA.
We checked in, immediately got taken back to a room, and blood tests were done, with some chest x-rays, too. Now we wait for everything to come back, to hopefully figure out why I keep having these pains. Not only do I suffer, but Philip and I hate to waste a day in the ER, like anybody else. And we got no real news from the ER visit. We were in and out in about 3 hours, and nothing came from it except some Indocin and Flexeril – muscle relaxers and a type of Advil, which I don’t/won’t take anyway. I didn’t have a heart attack, I probably don’t have a blood clot, but I should return if it worsens. Once this is posted, I will try to lie down again. 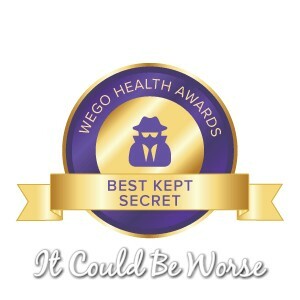 We think my pains could possibly be residual from the Humira, but a consult for a mammogram was ordered, and the ER doctor suggested contacting GI, again, about the pains. I will expect a call Monday or Tuesday about my blood draw and chest pains this week so I will fill them in when they do. After the ER visit, we stopped to get lunch, which was a bust, because I puke it up anyway. I have been on the steroid, Prednisone, for around 9/10 days, and I am still hurting and having issues. We are baffled it has not helped bring relief, yet. November welcomes month #4 of vomiting spells. Oh, how fun it is to be me. The comment on this photo is because someone actually accused me of inducing the vomiting with food. I don’t think they realize what kinds of food, and what little I am eating. Everybody is a doctor, it seems. Fingers crossed no more ER visits in the meantime. Mary, Mary, Mary…. What can I say? You are one tough cookie! You handle all your hardships with grace and with courage, where as many people couldn’t handle half of what all you live with. Especially with this new pain you are experiencing! Sounds horrible! Im sorry you had to go to the ER again. I know its the last place you want to be but I’m sure glad you went. I am curious to find out what is causing these problems. You worry me sometimes! Prednisone really should have been helping your Crohns disease by now. Of course you had to be apart of the small percentage that it doesn’t help as much as it should. My hope for you is that it will gradually build up in your system and start to work. You need a break for sure! Now, as for these cyberbullies (yes they know who they are). Who bullies people by sending out false information attached with lies, attacking without any justified reasons? Who makes fun of someone suffering with health problems? Lashing out at others just so they can feel good about themselves? Who does this? One word. COWARDS!!! Yes, these bullies are cowards. You know its funny when the cowards lash out then hide away, just so the people they attacked at can’t defend themselves. Again… this defines them as being cowards! These bullies (who know who they are) have absolutely nothing going for themselves, and in my opinion are simply jealous of you and Philip. You have a loving husband who has a career and works hard. He is there for you always and loves you more than anything. You have a beautiful house, with 3 fur babies. You already got your cosmetology degree and are almost done with your bachelors degree!! Above all you are a decent, smart, pretty and caring person. Needless to say, those bullies have A LOT to be jealous of. You getting sick, NOT your doing. You not being able to keep any food down, NOT your doing! Only people lacking intelligence would think otherwise. By the way… You ROCK the green hair! Totally you! That it is so very brave for Philip to go out with and help fight those fires. I know the people of KY greatly appreciate all that they do! As for you, I also think that once you are feeling better and are ready to do some on campus classes to become a phlebotomist, you would be really good at it! Be it working at the VA, a local lab or even helping with the Red Cross! I trust you’d excel! Set that goal for January, hopefully the Remicade will kick in by then and you will have more good days than bad! I know its going to be your miracle medication! BBBC!!! My Sister and my 21 year old niece suffers with Crohns Disease, stay strong! I hope they have found relief! This disease is definitely crappy. I hope you are doing well and I thank you for writing! My niece is just beginning her journey with it. Spending every weekend in the hospital. My sister has learned how to live with it since she’s had it for so many years now. Oh I’m so sorry. I hope they figure out something and help her find some sort of relief soon!